Education qualification must have passed Diploma in Nurshing or HSC or SSC or JSC exam completed. Interested candidates can be registration only Teletalk prepaid Mobile SMS. Applicant sent sms only English language. Mobile SMS method will be started on 17 June 2018 and it will be continue on 20 June 2018 at 11:59pm. BGB<space>87<space>DHA<space>236021<space>2012<space>40<space>Mirpur and send to 16222. 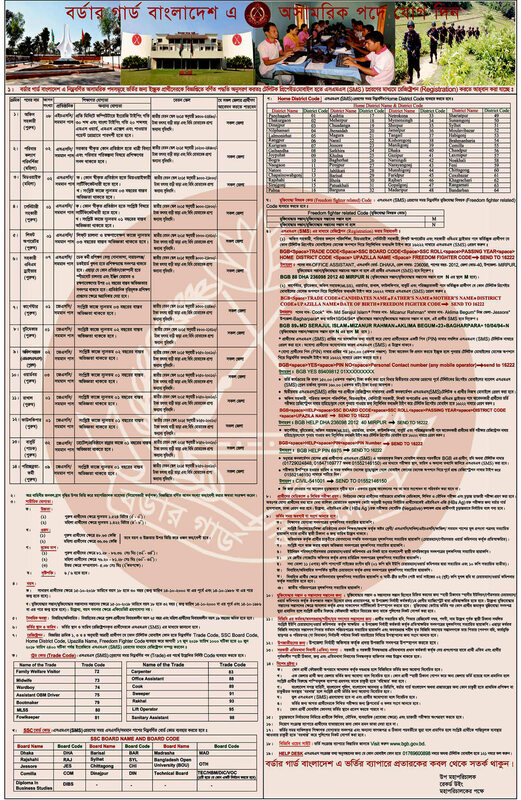 BGB<space>TRADE CODE<space>CANDIDATES NAME*FATHER'S NAME*MOTHER'S NAME*DISTRICT CODE*UPAZILA NAME*DATE OF BIRTH*FREEDOM FIGHTER CODE and send to 16222. BGB<space>89<space>SAIFUL ISLAM*MIZANUR RAHMAN *RAHIMA *23*BAGHARPARA*10/04/94*N and send to 16222. Applicant will be show all qualification documents in admission. BGB will be informed exam date and place by sent sms. Detail information is given attached as pdf file.